Essential oils have enjoyed a boom in sales over the last decade as people for searching for alternatives to chemical-laden products, for example, in regards to natural cleaners. And rightfully so – those things are scary smelling! Let’s all do our best to avoid industrial chemicals that are toxic both to the health of our bodies and the planet. How Much Plant Material Does it Take to Produce One Bottle of Essential Oil? Should I Support Wild Foraged Essential Oils Instead? Should I Buy Organic Essential Oils? Are Essential Oil Bottles Recyclable? Without getting into all the technical jargon that you can find on the internet, this is basically how you produce essential oils. Plant material grows somewhere, whether a farm or in the wild. This plant gets picked and collected. Run steam through the plant material to break down the essential components into oil and water vapor, which is collected. Change the steam back to liquid. Separate the oil and water. Looking through this process list, it looks pretty sustainable, right? You’re basically taking natural plants and extracting a part of the plant by running water through it. The problem is with how concentrated essential oils are – the sheer quantity of natural resources that must be used to produce a small amount of essential oil is staggering. The answer is LOTS. Thousands of pounds of plant material needs to be processed to get a small amount of oil (that’s how it gets so concentrated). According to Earth Island Journal, you need 10,000 pounds of rose petals to make 1 pound of essential oil. 250 pounds of lavender for 1lb. of lavender oil. 1,500 lemons to make 1 lb. of lemon essential oil. CRAZINESS! When you think about the ingredients, it’s plant material so it can’t be too bad for the planet, right? Sure, but we also have to think about the ecological impact in terms of 1) the amount of land being used to grow these plants, 2) the number of fertilizers and/or pesticides to grow & “protect” these plants, 3) land usage, 4) water usage, 5) energy used to harvest the plants and process them collect the oil, 6) disposal of the residual plant material, 7) transportation to retail stores, then to you. The below is a pretty cool clip about how lavender gets harvested from farms and processed into lavender oil and lavender water. You can watch below, but I’ve also summarize the main points below. Harvest flowers when they are purple-blue, on the verge of turning grey. Since weeds grow at the base of the lavender plants, blast the weeds with “a deathblow of hot steam” on a daily basis (hope no animals or insects are in that path!). A special harvester trailer pulls the lavender stems straight up, then snips the plant near the base. Load the plants thru a still to be processed. 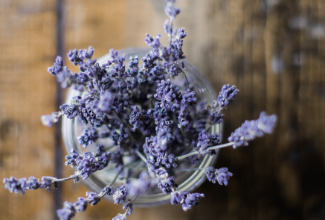 Start up an oil-fired boiler to convert water to steam, which runs thru the cut lavender for around 45 minutes to burst the glands (primarily in the petals) and extract the oil. Condense the oil-filled steam back to a water/lavender oil mix (40:1 ratio). Let the water/lavender oil mix settle and the oil will rise to the top. Separate the water/lavender oil mix to form 2 products: lavender essential oil, and lavender floral water. Products sent to a laboratory to be filtered. Did you think it would be so resource-intensive to produce a simple essential oil? I was pretty surprised when I started learning about it. One solution to large, corporate farming is wild harvesting, but this too has its downsides — some plants used for essential oils are listed on the IUCN Red List of Threatened Species, including sandalwood (Santalum album), which is listed as vulnerable, and rosewood (Aniba rosaeodora), atlas cedarwood (Cedrus atlantica), and rosewood (Dalbergia abrahamii), which are all listed as endangered. Also, imagine the amount of wild plant material needed to create the essential oils with the only incentive to take care of the land and ensure its sustainability is the individual. It just seems to me that this would be another ‘tragedy of the commons‘. Somalia is one of the few regions where frankincense trees grow wild. Harvesting the sap is quite profitable, especially with the increased demand in essential oils, the price for the product has increased by 600% in 6 years. The sap is tapped out of trees by making tiny cuts in the trunk. If the trunk isn’t given time to heal before more cuts are made, the trees will die. With the increased demand, people are more and more foregoing the long-term health of the frankincense trees for short-term survival. There are currently so many pesticides used to grow massive amounts of these plants for essential oils. Combined with the fact that there are currently no organic certifications specifically for essential oils, many large companies like YoungLiving and DoTerra cite this lack of certificating authority as a reason for foregoing organic certification altogether. Technically, yes. But practically speaking, seems best to toss in the trash. Here are some key reasons why. They are glass, but because EOs are extremely flammable, some cities – like New York – urge consumers to dispose of the bottle in the trash as even tiny amounts can be dangerous to those working in the recycling facilities. Popular essential oils that are extremely flammable include tea tree, eucalyptus, lavender, lemon, and peppermint. Be careful. If you want to recycle your empty bottle of essential oil, you need to remove all traces of the oil. But even that’s more difficult than meets the eye. Many essential oils are toxic to aquatic life so washing them down the drain is not the solution either. Best practice if you have extra essential oils is to diffuse them into the air slowly over time. But if you have pets or small children, diffusing the wrong essential oil, or in too large a quantity, is also dangerous and potentially toxic. One natural way to absorb the remainder essential oils from your bottles is to fill them with Epsom salts. It’d be like a DIY version of this. Additionally, if you’re not obsessed with variety, you can get a giant bottle of essential oil that will last you much longer so you don’t have to worry about disposal as often. Art Naturals has these 4.0oz bottles of eucalyptus EO and lavender EO, among other selections. By now, you probably understand that essential oils are not the golden-child wonder that will save us from health ailments, toxic chemicals, and smelly laundry without any repercussions to the planet. But what should we do about this new information? In my opinion, we can continue to use essential oils as a substitute for industrial chemicals, but use less rather than more. The world is going all crazy with essential oils as a cure-all for everything, including using them to wash your vegetables. I think this craze is in part because there are some huge multi-level marketing (MLM) essential oil companies out there. But remember, the less resources we consume, the better the planet will be. Don’t be a witness to the tragedy of the commons.